Slow cookers. Or crockpots. Whatever you call them, you've got to love them. Invented in the 1970s in the US, they've been a time and effort-saving device for home cooks for decades. And while we often talk about cooking stews and curries in the slow cooker, I think we can often neglect to cook other, more modern dishes in there. Did you know you could cook all this in your slow cooker? 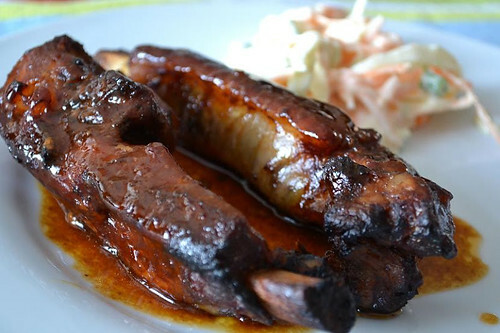 Soft, tender meat falling from the bone, doused in a rich, sticky barbecue sauce. Ribs are a great dish to cook in the slow cooker because it saves you so much time. Slather them in sauce and then pile them into your slow cooker's crockpot, on top of a sliced onion, for 4-6 hours. They'll be rich and really tender but they won't be charred or caramelised. For that, you'll need to give them a blast in a hot oven or under the grill just to blacken the edges and set all that sticky marinade. Check out how I do them here. I've needed to clean my oven a whole lot less since discovering how to cook an entire chicken in the slow cooker for Sunday lunch. Yes, you'll end up with soggy skin, but we don't generally eat that anyway. The flesh is tender and just falls from the bones, meaning you won't waste a scrap of meat. Save the cooking liquid for stock and make another batch by re-immersing the bones in fresh water and slow-cooking overnight. Check out Kavey's original post on this and also how I got on too. 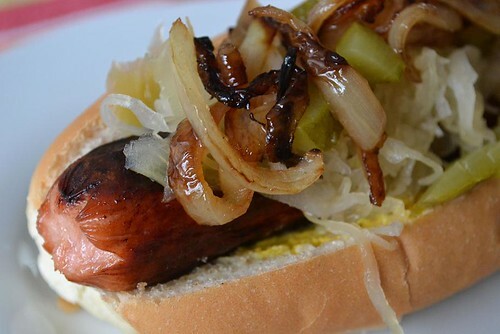 They only take about 4 minutes to heat up in a pan, but someone came up with the idea of cooking 60 hotdog frankfurters all in one go, in the slow cooker. I suppose it makes sense if you're feeding lots of people, and it will save you a lot of fiddling at the stove. Dump them in the slow cooker (you'll fit more in if you stand them upright) with nothing else (no liquid, no onions, nothing) and heat for 2 hours on high. I'd known for a while that you could cook cakes in the slow cooker, by scraping cake batter into a small round tin which you immerse in the crockpot in a little water. And you can also make little ramekin custards in the same way. My problem is that I don't own any cake tins that fit inside my slow cooker. But then I found a recipe that just asked you to bung the cake mixture into the crockpot directly and cook it for two hours. This hot fudge cake doesn't seem 'cakey' as a sponge would be, but the author says that they serve it warm with ice cream and it looks pretty good. I've tried cooking risotto in the oven, more than once, and it hasn't worked. It goes all crispy and burnt at the edges (I don't know what I'm doing wrong but it does). So it's always diligently stirred on the stove. But then I found a crockpot recipe from The Crockpot Ladies which just asks you to soften some onions, bung them into the crockpot, along with risotto rice and stock and whatever else is going into your risotto (meat needs to be browned first, folks) and leave it there. Tempting, when you're saving yourself from all that stirring, but it will take about 4 hours to cook. This is definitely one I am going to try. If you look for them, there are a number of bread-based recipes that are designed for the crockpot. Some of them you cook the dough in a tin or bowl and others, like this one, you just form into mini rolls and then slow cook them in a greased and lined crockpot for an hour. Brilliant. For some reason, I've always thought that pasta wouldn't fare well in a slow cooker. But I was surprised at the number of slow cooker pasta recipes that there are, including macaroni cheese and also lasagne. You just use the crockpot as you would a lasagne dish and spread the sauces, lasagne sheets and meat or veggies straight into it before replacing the lid and leaving completely alone for 4-6 hours. Hmmm. As with the drinks, I'm not sure about this one. Scallops only take a couple of minutes to pan-fry in a little butter, so I'm not sure why you'd put them in the slow cooker and cook them (gently, I know) for half an hour. 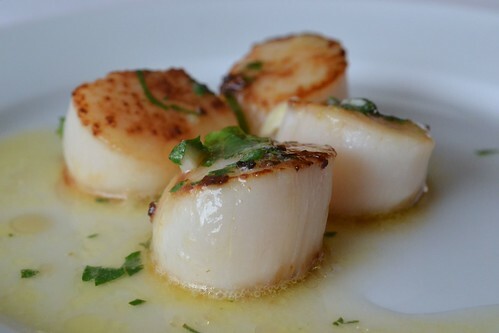 The creator of this recipe says that they're foolproof and perfect for if you're worried you'll overcook your scallops on the hob, which is fair enough. I'm not sure though if the 'environmental' argument for slow cookers would work here: the amount of energy to keep a hob going for 2 minutes probably isn't the equivalent of an hour's electricity for the slow cooker. Or maybe I'm wrong. Ah, yes. An hour in a roaring, 220ºC oven or a slow-cook in the crockpot for four hours? I like the sound of these, just pricked, rubbed with olive oil and sea salt and then gently cooked. I'm not sure if the skins would turn crisp though, (the way I like them) but then I guess once you've got your toppings on you probably wouldn't notice that much. How could I not include this? Check out this Crock Pot Cheesecake from the Crock-Pot Ladies - you just make the cheesecake in a cake tin that fits inside the slow cooker, pour in a little water for steam and then cook for 2 hours or so. Brilliant idea! Do you cook any unusual recipes in the slow cooker? I've definitely not been getting the most out of my crockpot, I tend to only do beef stew with potatoes and carrots or sausages and lentils in it. Thanks for all these ideas -I'm definitely going to try ribs soon! Brilliant Sarah, ribs are one of our favourites, although we're in the middle of a slow-cooked carnitas type phase at the moment...! Yes! Porridge sounds interesting - could you put it on overnight so it's ready in the morning? And rice pudding! Great ideas, going to look these up - thanks for sharing. Lovely collection, like Sarah I need to expand the way I use my slow cooker, I don't use it enough! I couldn't believe some of the things I saw, until I looked at photos and recipes from people who had done them - I will definitely be using my slow cooker a whole lot more now - thanks for coming by and having a look, Kavey!